The Monkey Bread Tree Film Awards: When did you decide to make The Guitar, and what were your immediate production difficulties faced by this particular project? Michael Boston: Just months after the response went so well for Dress Rehearsal, the idea of finally getting this story before the cameras just kept staying in the back of my mind, so I thought what’s the worst that could happen? So really dove into it and though, I entertained the thought of crowd funding, I decided to fund it on my own with a lot of sacrifices rather than have to spend the time on an online campaign. I could just stay focused on the creative. Immediate difficulties were just deciding which bank should I rob. TMBT: How are you finding the changing landscape of film cast and crew searches through social media? Or do you still work in an old school style? MB: Well, everybody’s out there now, right? It’s amazing how many people get a nice photo taken, go onto social media, label themselves as an actor without paying some assemblage of dues. But whatever. I think actors access, casting networks are really good. But I also think that an actor-ran company like Cazt is great, too. Lots of hungry actors go through their doors, me being one of them, lol. I think trust is ultimately the biggest factor in casting. I used several people in The Guitar that I used in Dress Rehearsal because I trusted them and also recognized how giving there were as actors. Who gives a damn if you have 1000 followers on twitter, two-thousand friends on Facebook? I just want to be around actors that are actors not attention whores. TMBT: There’s a real sense of community within this project. How did you cast this ensemble so well? MB: You know, Ben, that really really means a lot. I think it’s instincts again. These people really like each other. They’re unselfish. They have big hearts. I can not tell you how underused they were, especially those with just one or two lines or maybe just in the montage. Their previous work is so admirable. Christine Kent, Shannan Leigh Yancsurak, Karin Tracey… really terrific actresses… and we got the amazing E.R. Ruiz to come in and help. Samuel Whitehill and Michael Keyes work like crazy and they believed in our story if only to be in it for a matter of seconds. Blessed, blessed, blessed. They started calling themselves Team Guitar and it gave me goosebumps. TMBT: When did you decide on making such a large short film? Have you ever considered a plot of this nature worthy of say a feature length? MB: Are you trying to say the The Guitar was too long? Hah! Cause yes, I realize it could have been shorter. Our opening was very feature film-like but it did establish this guy had an addiction, loved his guitar, was not special to anyone on the streets and soon enough he’ll meet some kid and things will change for him… good or bad. I think we used a lot of our footage and maybe I became a little too preachy. Lesson learned. The art of short films is keeping it short. No, I don’t see it as a feature film. Maybe a good character in an ensemble piece like a reunion type of film, like where are they now? TMBT: How long was the shoot for The Guitar? MB: Really ended up being about 6 days total. But very spread out. Raquel Gallego, our DP, had an assignment in Europe after the first 3 days, so we broke it up and came back a few months later to get Leo Winston’s past filmed. This allowed me to put weight back on and look somewhat healthy again. It worked out well. Half was shot in studio, half on location. We knew the shots we needed but the alley shots became compromised, I’d say. We had to rely on Thaddeaus Ek’s voice-over to fill in some blanks. TMBT: What is your particular editing process for a short of this size? MB: Pedro Gonzales Kuhn was a warrior with Premeire Pro and I had already spent a couple of months reviewing everything first before I approached him. I really don’t think size mattered. He worked in binges and we reviewed, repeated and he mixed the sound from a music library for us. You know, there really wasn’t much wasted footage on this project. TMBT: You’ve been working in film for quite a few years now, how has the industry landscape changed? MB: But I was out of it for a long time, too. So I came back in and had a lot to learn and boy, am I still! I am humbled by it all and I listen to to these young filmmakers and learn from them. I think there are obviously more opportunities to create content like never before. Friends can pool their money together and or can raise it and shoot short films every month, couldn’t they? You don’t have to have to go into a bigwig’s office and make the film he wants you to make. Exciting! TMBT: Have you found that your expertise in filmmaking still grows with each project? MB: OMG, still learning! I think you remember what doesn’t work the most. I look at Raquel and Steven Jared Mangurten (DP on Dress Rehearsal) as huge mentors to me. So much respect for them. I think these two films are very simple and realize that the possibilities are endless. I absolutely love ShortsTV and see what other filmmakers are creating and it’s so inspiring to me. I still believe it’s story first, but what can be added to that with creative DPs, editing, effects and it’s limitless. TMBT: What have you been working on since Dress Rehearsal and The Guitar? MB: I’ll just say something not quite as dark as the first two. Some light-hearted romantic stuff. Love is a beautiful premise. TMBT: Filming such a rough portrayal of life must have waned on you as an actor. What did you do to prepare for the role? MB: Dropping weight, living on coffee and 5-hour energy does not make for happiness. I was very uptight and on edge, very nervous but that really served that character well. I tried to stay stinky, haha, so maybe that was selfish to cast and crew. But they were all very understanding. I actually dressed the set for the alley scenes. Had went to homeless areas, grabbed the shopping carts, that blanket used in the opening was actually from the trash… kept it unwashed. I figured if it was good enough for the homeless, it was good enough for Leo. I think my co-workers from my real job suspected I was sick and or doing drugs because I kept hearing I was getting too skinny. Internally, I was blocking out my feelings of hope. It was very depressing. TMBT: What’s your favorite swear word on a film set? MB: If I ever get to work in your neck of the woods, it’ll be c*nt! (hey UK filmmakers, just bought me some red plaid East End pants, btw, if I’m needed), ah but in the states, I’d have to go with the f-word cause that’s what I’ll use when I just realize I had forgotten one thing or another! TMBT: How big a role does music play in your life? MB: I’ll say it’s increasing. I’m really late to the party on that. I soooo love music now and realize how important it is. How could we survive without music. If that was taken away from us, I don’t know how we’d survive. Bread, water… music. It’s a necessity. Football would be next, btw. TMBT: If you could revive any crew member from the past to work with, who would it be? MB: I’d want them all! Steven, Raquel, Sequoia Thompson! Andrew Pouch. 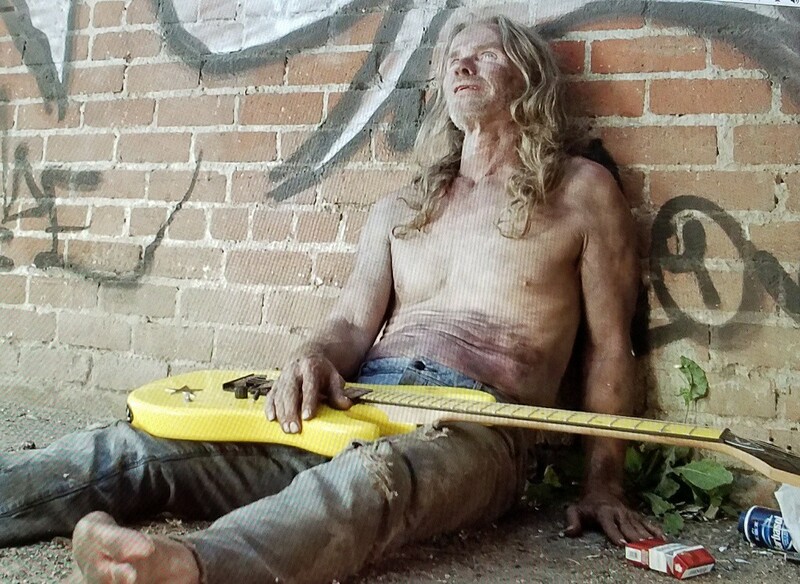 John Haegele stepped up and ran the show for us one day, besides his acting duties on The Guitar and saved us. TMBT: Have you ever considered quitting filmmaking? And if yes, what stopped you? TMBT: Can cinema really save us? MB: While it’s such a huge part of most people lives, a healthy… and at the same time an unhealthy diversion… to some, we should never need cinema to save us. Please note: you can watch Destiny below this interview. 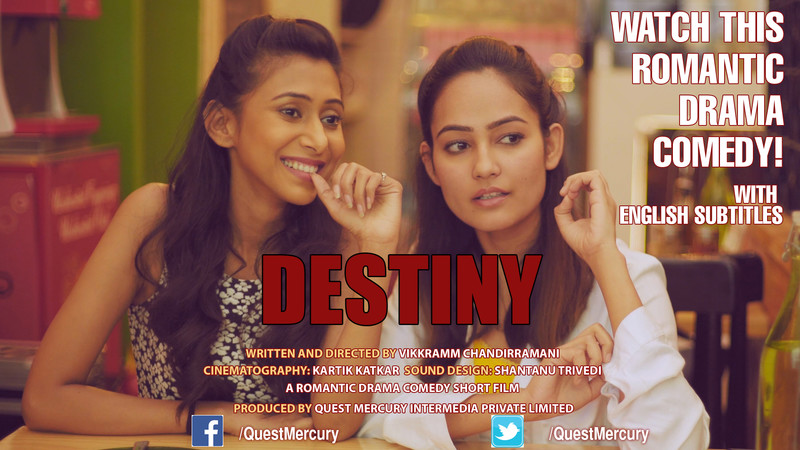 The Monkey Bread Tree Film Awards: When did you decide to make Destiny, and what was the reason behind making this particular short film? Vikkramm Chandirramani: I had been writing a lot these past couple of years. The idea for ‘Destiny’ originated from a discussion on a forum which I ran for a while on one of my websites. People were making anonymous confessions and this young woman confessed to harassing her ex, who had dumped her, by making fake profiles and standing him up. 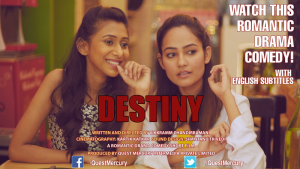 I fictionalized it to turn it into a short story and then a screenplay which ultimately became ‘Destiny’. I thought it would resonate with urban men and women in their twenties and it did, fortunately. That’s my audience on the internet in these parts. TMBT: How does your casting process for film look like? VC: The right casting is really important. If you cast the right actor in the right part, that’s half the job done. Looking the part and being able to perform are important aspects. We don’t do ‘cattle calls’ or ‘open auditions’ as that wastes a lot of time of everyone. We request work links from actors who have some prior experience. We then invite select actors who may be suitable for a specific part, to audition. Before an actor shows up we’ve probably already seen at least some of their work. So, anyone who’s invited to attend one of our auditions already has a good shot at landing the part. My options are wide open when we invite actors to send their profiles. I rarely have biases in terms of how tall a character is or what he or she looks like unless it is relevant to the character or the plot. I audition actors myself. TMBT: The home setting for your film was very carefully laid out – what’s the story behind the film’s design? VC: Thank you for noticing that! We got a nice apartment which was sea facing. So, it was quite well lit. We dressed it up to make it come across as the apartment of a young single woman in her twenties. I went shopping for a lot of the props with some of my crew. Some were ordered online. The curtains which you see were custom made. The upholstery was bought. My wife made the bulletin board. It was all done inhouse. We didn’t have the budget for a production designer but we wanted visual appeal. So we had to be inventive. TMBT: What’s your approach when filming scripted material? VC: I write and direct myself. I also edit. My writing style is rather visual. So it’s easier when I turn a story into a screenplay. I keep my cinematographer and sound designer in the loop. We visit locations to assess any potential challenges of filming there. If it’s a very dimly lit location with no natural light, we’ll need more lights and time to set it up. If there’s a lot of traffic noise, sync sound may be hard to pull off. Before we go on set, we’ve taken some reference pictures and are on the same page about the shots we’re going to take though I don’t storyboard too much unless it’s going to be a complicated scene. That said, whatever you do, some unexpected hitches will always come up when filming and have to be dealt with. TMBT: How long was the shoot for Destiny? VC: There were three days of filming. We shot a significant part of the film in an apartment at Bandra. Some parts were shot at my office at Oshiwara. We did some guerilla shooting on the streets and inside Starbucks. The pre-climax was shot at a cafe, 1441 Pizzeria while the climax was shot on Versova beach. TMBT: What is your writing process for this project? VC: My father was a prolific writer. So, writing comes naturally to me. Stories are about conflict and there’s conflict in our lives and around us all the time. Stories come to me in various ways. It could be from something I read in the newspaper or a remark someone made. It could be from an experience or a memory or by watching something happen. From there it evolves into a plot. Sometimes stories stay with me for months and I suddenly think of an aspect that could improve a particular story. When I’m convinced about a story, I turn it into a screenplay and write the dialogues. So at any given time, I have various screenplays at different stages of completion. TMBT: Have you felt a change in the way you think about filmmaking since making Destiny? VC: In India when you make a short film and place it on YouTube, you’re competing for attention with major film production houses who have hundreds of millions of dollars at their disposal and well known artists on speed dial. I thought it would be very difficult to have my film watched amidst the productions of these gigantic companies. Now I realize, people on YouTube are open to watching films featuring and made by new artists! That is heartening. ‘Destiny’ has gone past 2.25 million views, purely because of word of mouth. TMBT: What have you been working on since this short film? VC: I have been writing a lot these past couple of years. So I have quite a few screenplays to pick from. I’ve yet to decide which one I will go ahead with now. I get rather adventurous when I write! So, I end up with several characters and multiple locations. My film ‘Screwdriver’ had thirteen characters! ‘Destiny’ had several locations. So, when I want to make the film I have to be inventive to pull it off. That takes a while and I only work with a ‘shooting ready’ script. TMBT: What would you say are the difficulties and benefits of filming in India? VC: I can’t say about India as a whole because the entertainment industry is huge and has various issues which some of their leaders would be better in a position to speak about. As someone who has been making short films, we need to have an easier process to get permissions to shoot in public places. All red tape should be waived for filmmakers making short films or working on small budget features as long as people are not being inconvenienced. No formal permission should be required. The benefit here is that there are two things people in India love: films and cricket. So, if you make an entertaining film, people will watch it in droves. With the internet growth exploding, it’s only going to increase the audience. TMBT: What’s your favorite film set food snack? VC: I love vada pav and samosa with green chillies and dry garlic chutney! You should try it if you’re in Mumbai someday. TMBT: How big a role do apps play in your life? VC: I have an iPhone and apps do play an important role. Social media apps are an indispensable part of my life as much as of the next person. I use apps to keep track of news, to navigate through traffic and shop online! When it comes to reading, however, I prefer the feel and fragrance of a book over a tablet or e-reader. VC: Cinema as a medium must be used for bringing about social change. However, films must be entertaining, primarily. Cinema is as much a business as an art form. Otherwise films with social messages can become preachy and the tail will be wagging the dog. The Monkey Bread Tree Film Awards: When did you decide to make Afrit, and what was the reason behind making this particular short film (pushing aside your course)? 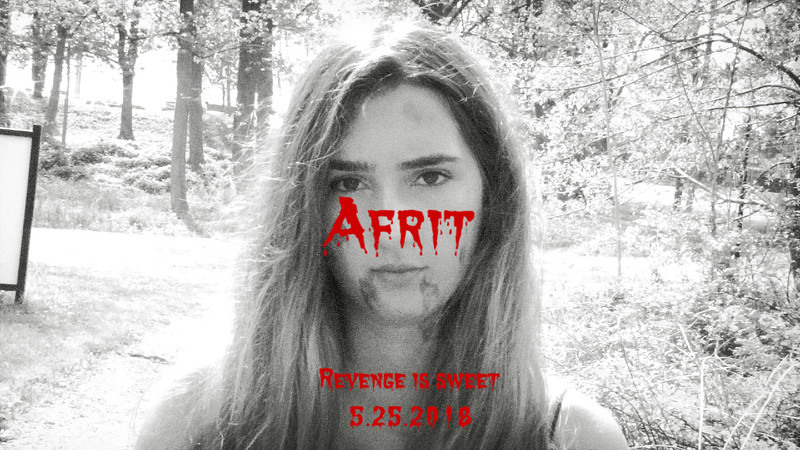 Richard Schertzer: I started production on Afrit in April of 2017 and the reason behind making this was to extend the string of films in the ‘Horror Extended Universe’ which is a shared cinematic universe for horror films under my film production company Wyvern Studios. I also wanted to make a stalker-type horror film. TMBT: How does your filming process for look like? RS: What I do is I assemble my cast and crew and shoot the harder scenes first so that way I get those shots out of the way and then I work my way into the easier shooting. TMBT: The locale of your film was rural, but also somewhat delicate in its handling of the buildings which litter the space. What was the thinking behind the film’s overall design in terms of its areas depicted? RS: We filmed the short at Manhattanville College and began filming near the school’s little chapel and moved over to buildings in founders hall to get a more claustrophobic feel. TMBT: What’s your approach to working within film genre? RS: My approach to working within a genre is to use what I know about that particular genre and then apply it to my work. TMBT: How long was the shoot for Afrit? RS: The shoot for ‘Afrit’ only took one day. TMBT: What is your visualisation process for this project (storyboarding, look books etc.)? RS: I wrote up a script and basically winged it. TMBT: Have you felt a change in the way you think about filmmaking since making Afrit? RS: Yes. There are pros and cons to working in a small crew for a film set. Pro; you can do what you want with as much time as you want without studio interference, but Con; you have to work harder at what you are doing. TMBT: Is attending a film making course important to you? RS: It’s very important to me. TMBT: What would you say are the difficulties and benefits of filming a student project? RS: The difficulties are that you work in a small group which can limit the number of jobs on set, but you are able to do whatever you want with the time you are given. TMBT: What’s your favorite moment when making this project? RS: My favorite moment was when we were all on the trail of the little chapel and I held the camera on a shoulder rig, kept it on the focus frame of the first girl and ‘dollied’ so to speak to the stalker demon, which I thought elevated the ominous mood. TMBT: What do you imagine your future films, post college, will be like? RS: I actually plan on directing short films after college and starting my own business in filmmaking and move on making feature-length films. RS: I believe cinema can save us because it provides an outlet for those that create it and inspiration for those that watch. TMBT: What does the title of the film mean? 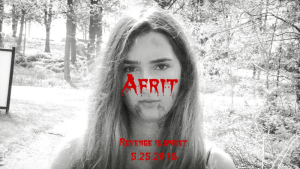 RS: Afrit or Ifrits are a class of infernal djinn and also held to be a death spirit drawn to the life-force (or blood) of a murdered victim seeking revenge on the murderer. The Monkey Bread Tree Film Awards: When did you decide to make Snapshots, and what were your immediate production difficulties faced by this particular project? Jan Miller Corran: The script was conceived around two years ago and was ready for filming in the summer of 2017. 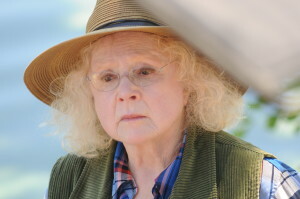 As it is a film that takes place by a lake, one obstacle to address was finding lake in a drought. Plus each day of filming happened during a major heat wave. JMC: Finding our cast was actually a combination of old school and use of social media. I discovered Shannon Collis who portrays Young Rose through an IMDB search. This led me to contacting her through Twitter. Other cast were secured through friends or long time connections. TMBT: There’s a real sense of a family unit within this project. How did you pursue this ensemble of actors? JMC: The success of this story is highly dependent on the ensemble cast. As the story is based on a true story about my mother, I had visualizations of real life people in mind. Granted the characters that surround the core of the story are fictionalized there comes a genuine knowing of who each character is and how each fits in with the others. In hiring actors for each role, the consideration of how they fit into the entire family unit was strong. The film has won awards for best ensemble cast so we must have succeeded in doing what we set out to achieve. TMBT: When did you decide to make Snapshots? JMC: In early 2016 I shared the script with Lee Anne Matusek who became co-producer on the project. In turn she shared the script with her friend, the actress and director Melanie Mayron. Mayron was immediately enthusiastic about the story and jumped on board. TMBT: How long was the shoot for Snapshots? JMC: It was a three week shoot. TMBT: What is your particular editing process for a script of this nature? JMC: I write freeform and do not edit as I go. Once the script is complete I then share it with people I rust to be 100% hones in their criticism. Then the editing begins. The story gets tighter and the nuances unfold. TMBT: What was it like to collaborate on this screenplay? JMC: In a sense, the script from the first draft to the last day of filming is one of collaboration. for example, the impact of a very quick shooting schedule required changes in scenes to best capture the best of the dialogue without requiring more time to shoot and re-shoot. Often the actors got to know their chaacters so well that they would state that, for another example, “I think Rose would respond this way”. Remember we had incredibly talented actors. For me, if Piper Laurie stated she felt Rose (her character) would phrase a line differently than what wrote, I trusted Piper to know best. JMC: Every film project comes with lessons. I’ve been involved in 20 films since 1995. From shorts to documentaries to feature films, each provided challenges which educate one for the next project. Each time a project ends I say that I’m “never going to do that again”. But with the next project new challenges arise and you employ what the last project taught you. Each film has it’s mistakes and surprises along the way. TMBT: What have you been working on since Snapshots? JMC: I’m currently involved as a co-producer on a project with the working title “Follow”. Then, I have written a script “Turn Left at Shambala” with Toronto based writer and director Kate Johnston of the award winning film “Tru Love”. Both projects are in finance seeking status. Both films have cast attached. So, it will be the acquisition of finances and then filming will begin. TMBT: What’s your favorite moment when working on a film project? JMC: It is so hard to pick one. The moment a director says they love the project is one. Then, when you sit in a room and see theend results of all the editing of countless hours of filming appear on the screen it is a incredible feeling. TMBT: How big a role do your idols play in writing a screenplay, and who are your writing idols? JMC: Lillian Hellman is definitely a writer I’d aspire to be. She took risks and did what I hope Snapshots does- tell a complex story in a simple way. Another writer I highly admire was Nora Ephron. My personal love goes to all writers who successfully turn an Agatha Christie novel into a screenplay. TMBT: If you could revive any cast member from the past to work with, who would it be? JMC: If I could go back in time I would have loved to work with Katherine Hepburn, Sandy Dennis, Jack Lemmon, Lee Remick. Really too many to name them all. JMC: Everytime I walk off he set when the director says, “It’s a wrap” I swear I won’t do it again. I’m mangled. But then the next day I can’t wait to dive into the next project. Images courtesy of Three Women in a Box Films. During 2017, The Monkey Bread Tree Film Awards was associated with FilmHuman. Due to low readership FilmHuman closed end of 2017. These three issues are maintained via MagCloud. Third time’s the charmer. Right? For this issue we have Michael Boston chatting about his fantastic short film Dress Rehearsal, Mia Mullarkey talking about her Amsterdam traveller Oh Brother, Thorkell August Ottarsson speaking on his feature Suicide Squad, Josiah Cuneo dancing around his Lilt, and lastly, Duane Michals getting all handsy with The Pleasures of the Glove.